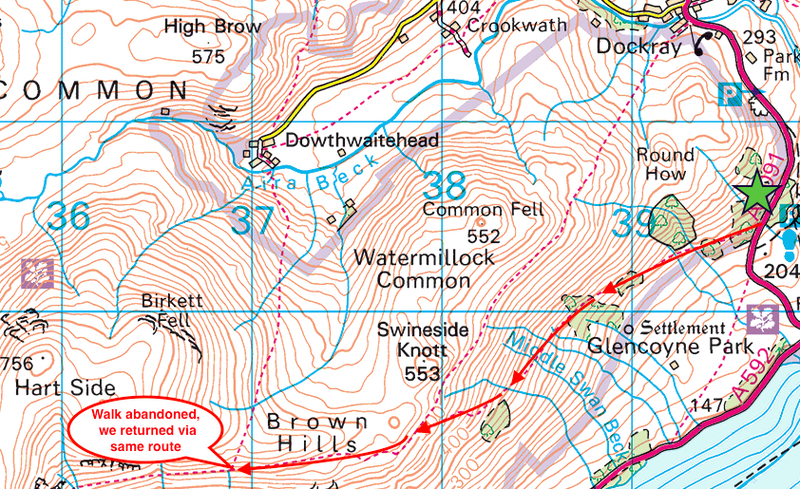 The weather forecast said today would be the best day of the week so, thinking that we would not have another opportunity to get out for a walk this week, we set out to go up to Birkett Fell and Hart Side. Close to home and not too high a level. We didn’t rush to set off as we could see that it was still gloomy outside and that things were supposed to brighten up by late morning. We left the Aira Force car park on Park Brow and set off along the footpath, which started just across the road from the car park entrance. We should have known how things would be as soon as we set foot on the path, mud and water under our feet everywhere and heavy grey cloud above our heads. 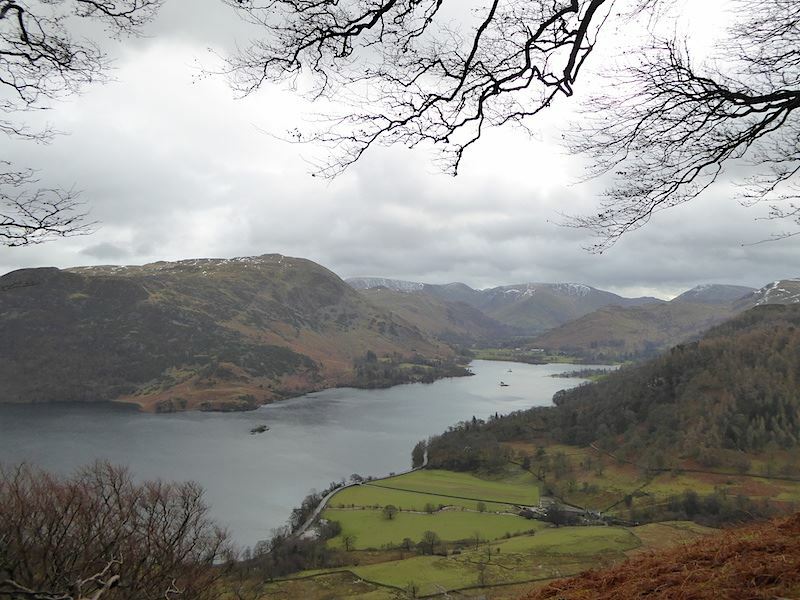 This is the view looking towards the Glenridding end of Ullswater as we walk along above Glencoyne Park. 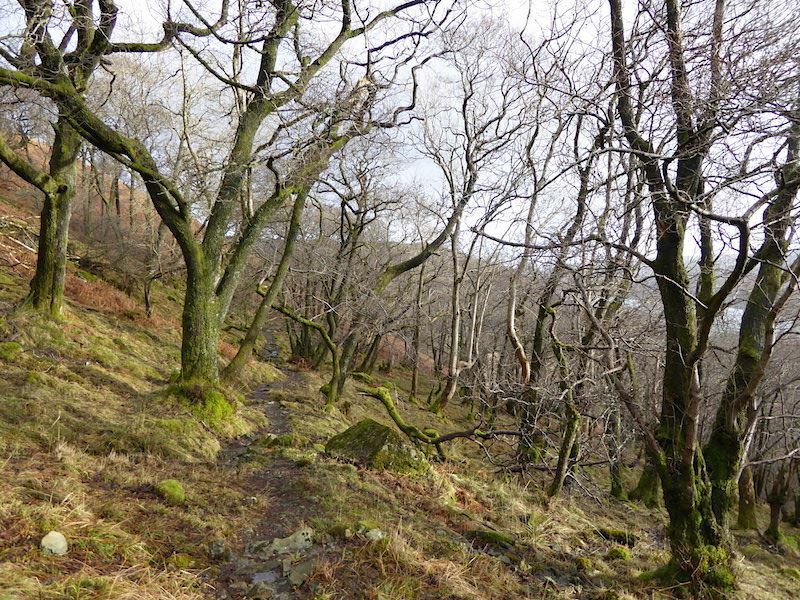 It was hard going along the very muddy and uneven path, side-stepping the very frequent and very boggy areas along it every few steps or so, keeping up a reasonable pace was impossible, it was hard enough to stay upright. 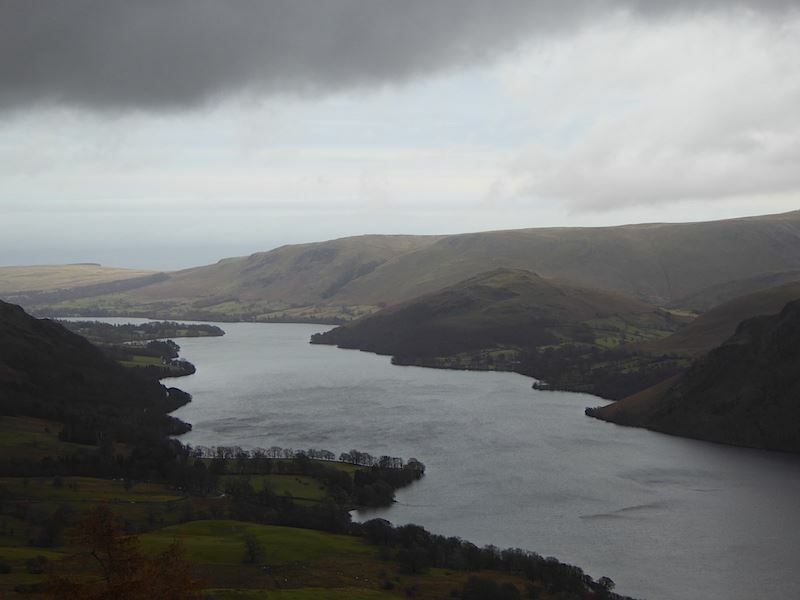 Here we’re looking east through the gloom across Ullswater. 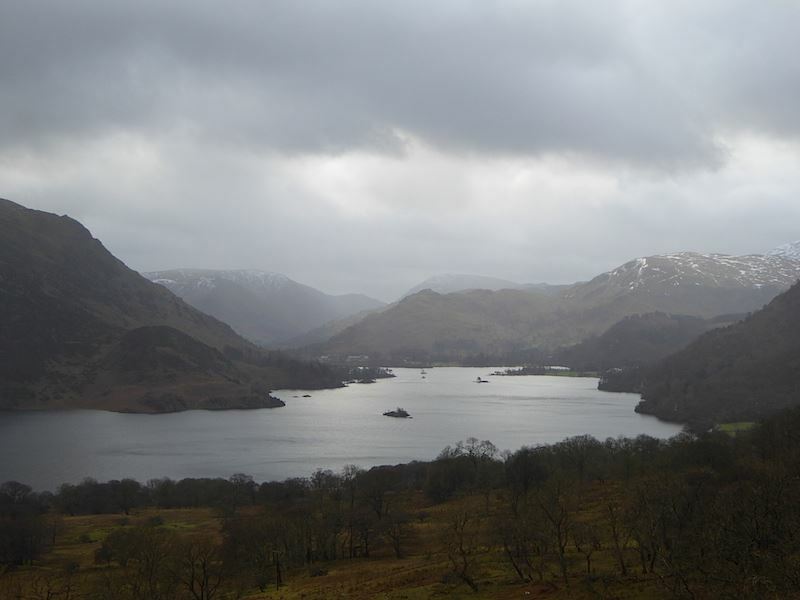 After one of the frequent rain showers I noticed one of the ferries battling against the wind and making its way to Glenridding. 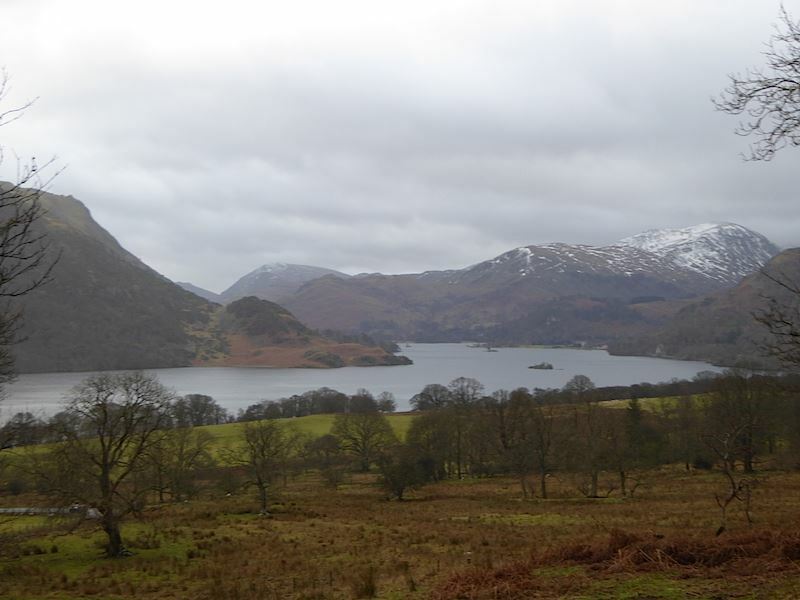 The snow has almost gone from Place Fell. The weather is closing in. Wonder where the sunny spells are. 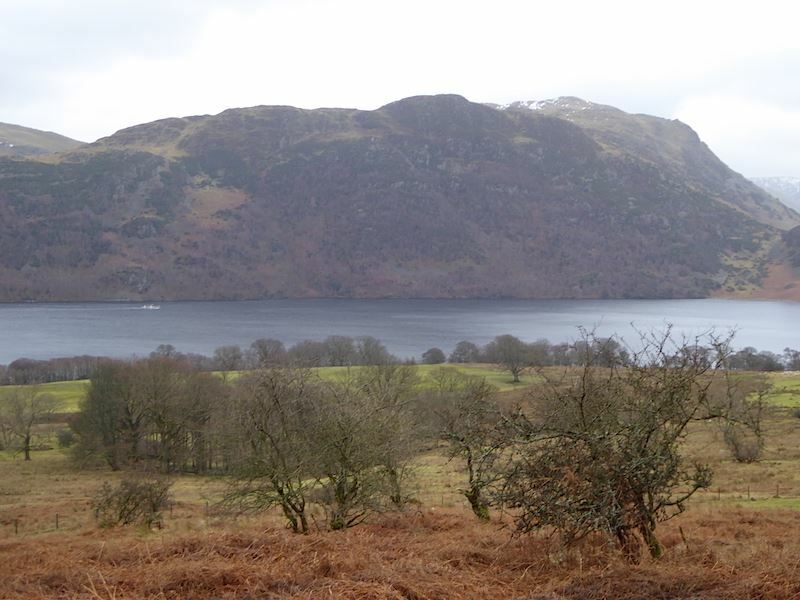 Looking north along Ullswater. It looks brighter in that direction but the weather is going that way so the brightness will soon disappear over there too. Looking back at the path through the woods, this was one of the less muddy sections. A small gap in the clouds allowed the briefest moment of sunshine to get through. 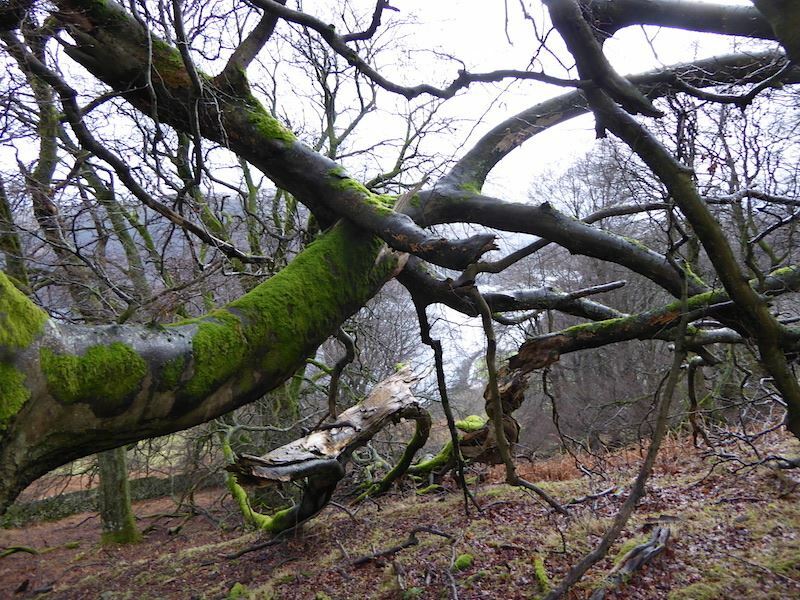 Just one of the many fallen trees in this wooded area, we’ve had one storm after another this winter so its not surprising to see uprooted trees everywhere. Still no sign of a break in the gloom. Over us the skies just get darker and darker but we persevered and reached the point at which we would turn up to Birkett Fell. 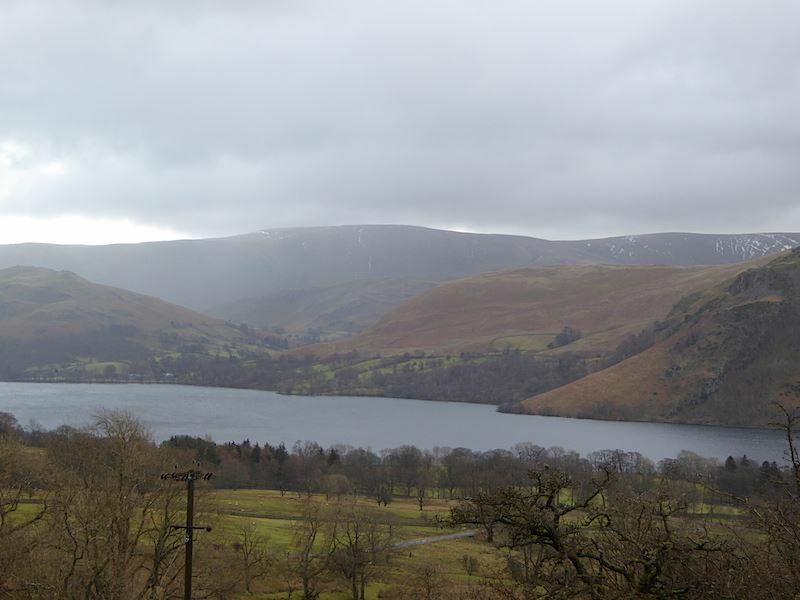 The wind was now really strong and we could see the dark clouds coming in towards us, the fell tops were covered in cloud and the promised sunny spells were nowhere to be seen. 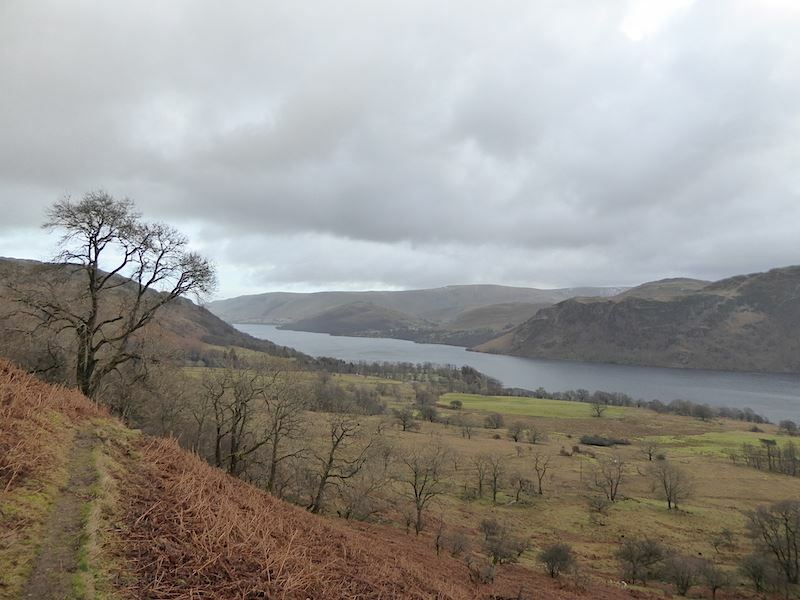 I had already had difficulty breathing, due to the viral bug I’ve had for weeks now, and found breathing even more difficult walking into that wind so, in view of that and the prevailing weather conditions, we decided against continuing as it was just too cold and unpleasant. I don’t like having to abandon a walk especially as we were so near to where we had intended to be but it can be done again in better times. We returned to the car by the same route which was just as difficult underfoot although neither of us suffered any mishaps. If that’s the best day of the week I wonder what the rest of it will be like?